Designed for ultimate comfort, performance and safety, the Ansell E022Y Electrician Class 2 Yellow Insulating Long Rubber Gauntlets provide both electrical insulation and arc flash protection. Produced using a proprietary, environmentally-friendly dipping process, these latex gauntlets offer superb flexibility and dexterity for precision electrical work. 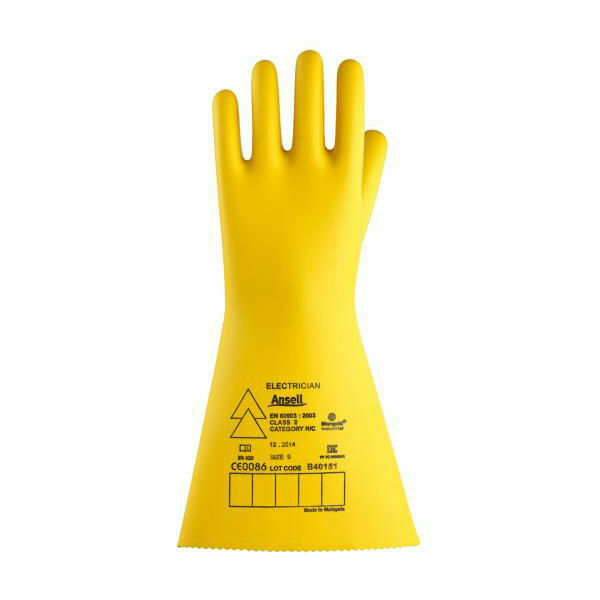 The Ansell E022Y have been tested in accordance with EN 60903, the European standard for electrical risk gloves. They have attained a Class 2 rating, meaning they are suitable for voltages of up to 17,000V, and they are also designated Category C gloves, meaning they are suitable for use in very low temperatures. Additionally, in accordance with EN 61482-1-2 (2), the Ansell E022Y offer electrical arc flash protection. The Ansell E022Y are designated Category III gloves, meaning they have a complex design which is intended for the highest levels of risk. The Ansell E022Y are available in four different sizes. Please measure the circumference of your hand around the knuckles (excluding the thumb) with your hand open and your fingers together, and the length of your hand from the tip of your middle finger to your wrist. The Ansell E022Y feature an overall length of 410mm.